You can use Goals to measure how much value you get from your LiveChat. You can see how many chats end with a desired effect like closing a sale or a potential customer signing up for your newsletter. There’s a a ton of different situations you can measure with Goals. Read on and learn how to set them up and use them in your business. To start off, go to the Goals section. Click on the Add your first Goal button to begin the setup. Set by LiveChat API: The Goal is marked as successful by LiveChat API when the visitor is supposed to end up on a site without the LiveChat tracking code. Use this type of Goal to measure how many chats end with your visitor going to a particular site. For example, you can measure how many visitors get your checkout page after a chat. This will allow you to see how much your LiveChat contributes to your sales. Go to the Goals section in LiveChat settings. Click on Add new goal button. Enter the name for your Goal and select visitor lands on a specific page… from the drop-down menu. Choose whether the address should be an exact match or it should only contain a part of the address. Enter the target URL address and click on Add new goal to finalize. Your goal will now show up in the Goals section. Every time a visitor comes to the specified address after a chat, it will be counted towards that Goal. You can see how the Goal performs by choosing the Reports option. You can also see all chats that ended with this Goal with the Archives option. This Goal type is useful when you don’t really send customer to different URL addresses. For example, when you have a dynamic website that doesn’t change the URL address when customers enter checkout. Read more on custom variables configuration. Click on Add new goal. 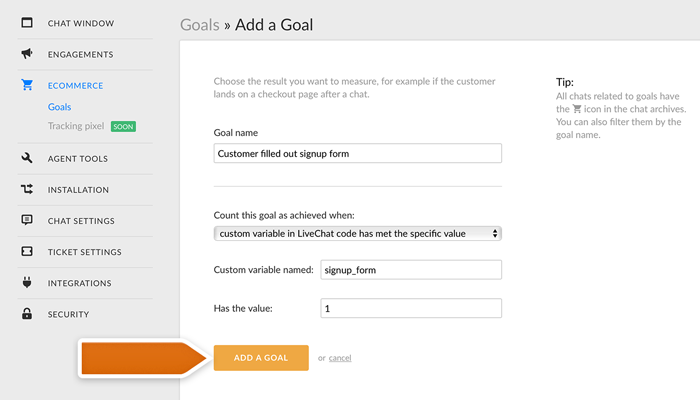 Name your Goal and select Custom variable in LiveChat code has met a specific value from the drop-down menu. Enter the variable you want to check for and specify the value it should have. Select Add new goal to finalize. Now every time the particular custom variable value is met, it will count towards the Goal. Instead of setting one broad Goal for all sales, you can create several goals for different value brackets. 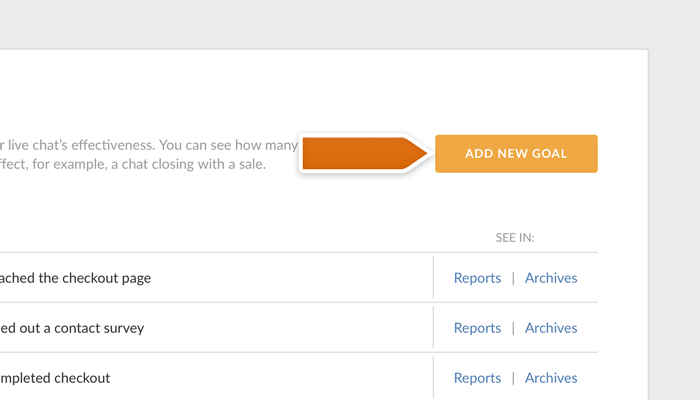 Create several such brackets for different price ranges to see more clearly how LiveChat affects your sales. 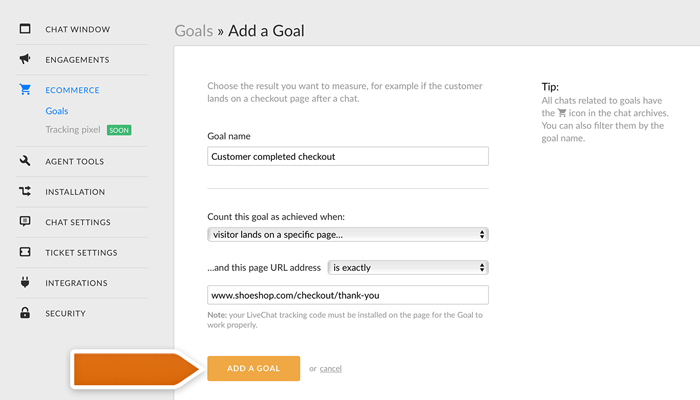 This Goal type can be used when the Goal is completed on a website without your LiveChat tracking code. For example, you can use it when you want to see how many of your visitors go to your partner’s website. Click on the Add new goal button. Name your Goal and select LiveChat API request is sent as the condition. 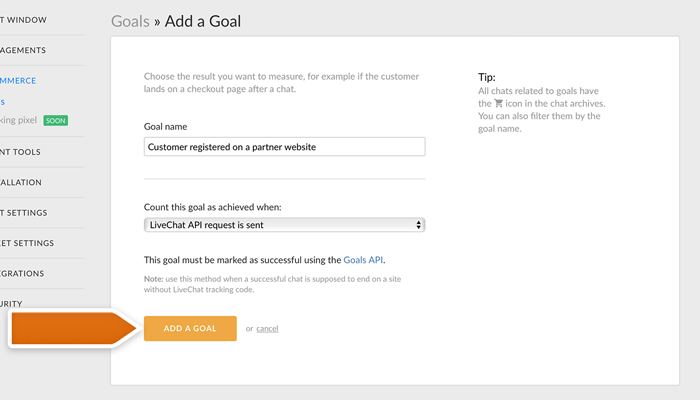 Complete the setup of the Goal by using our Goals API to send requests every time the Goal is completed. 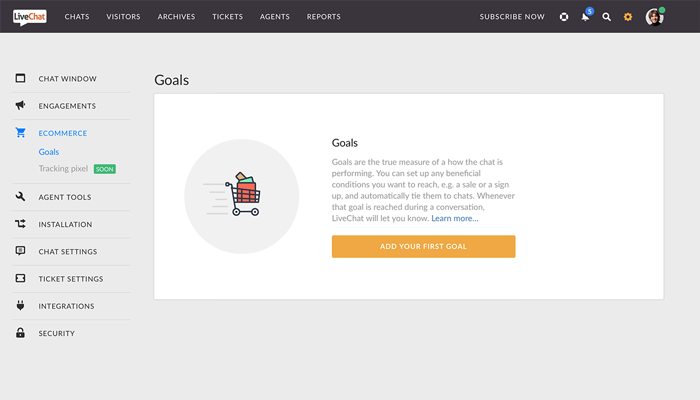 Goals can show you exactly how productive your LiveChat is to your business. Use them to see what kind of profit your are getting from chats and to monitor all kinds of desired actions your customers should take after chat.